Of the many Thai Art Galleries located around Thailand, you would be very hard pressed to even visit a fraction of them on any single holiday vacation. I try to visit as many of these art galleries as I possibly can without going overboard. I also like to get involved with loads of other activities while touring the country so I shall accompany you on these artistic journeys of discovery as I uncover them. Please don't be surprised though if you feel that I have a preference for modern Thai art, but I shall endeavour to be as unbiased as possible. Let's face it, art can be very expensive for the average buyer if you are looking for art as an investment, but if you would like something more personal to fill the gap, why not visit one of the local Thai Art Shops when next in the country. You will find many of them at your favourite beach destinations such as the ones in Phuket and Pattaya. If you like, I could even recommend a few good ones so please feel free to contact me anytime for advice. Thai artists have such amazing talent in all the arts and they can create any oil painting or charcoal specifically for you. Be it a copy of an original or perhaps your own favourite family portrait, you will be more than satisfied with the results. Prices are very reasonable too and if necessary you can always bargain for an even better price. How these Thai artists get around copyright infringements is anyone's guess. I wouldn't even attempt to ask. Should you be requiring an original authentic artwork then you are more than welcome to view the fine art galleries I have listed below. You may purchase a variety of items from some of these galleries. Contemporary, modern and ancient forms of art have attracted collectors and admirers to Bangkok because of its abundance. On this arts tour, you'll have an opportunity to dive deeper into the Bangkok art scene and tour the most recognisable places displaying the finer works of art in its full glory. Below you'll find several Thai Art Galleries that I have visited around Thailand. I shall endeavour to keep you updated when I become aware that there may be something new and exciting about to happen on the Thai art scene. Should you know of any other interesting or unusual Thai Art Galleries around the country that you believe may be of importance, then please feel free to let me know and I could add your findings right here for all to share. The National Gallery located at 4 Chao Fa Road, Phanakorn in Bangkok is open every Wednesday until Sunday from 9.00 am to 4.00 pm with an admission fee of just 30 Baht. Here you'll find mostly contemporary and traditional local Asian art, though non-Thai exhibitions are sometimes held here as well. The Queens Gallery, located at 101 Ratchadamnoen Klang Road is open every day from 10.00 am to 7.00 pm except on Wednesdays. The gallery has an admission fee of just 20 Baht. Here you'll find art from world-class local and international artists. Sriphiphat Art Gallery at Soi Somdej Chaophraya 3 Klongsarn in Bangkok is situated in the grounds of the Princess Mother Memorial Park in a small white building. Photographic displays by Thai photographers are on permanent exhibit, albeit on a rotating basis. The gallery is open daily from 9.00 am to 4.00 pm. The Jim Thompson Art Gallery at 6 Soi Kasemsan 2 Rama 1 Road, Wangmai Pathumwan is situated at the same address as the Jim Thompson House Museum, a traditional teak home where Jim admired and amassed both Thai and South-East Asian art for his own private collection. The purpose of the gallery is to promote awareness in cross-cultural contemporary and traditional arts with exhibitions, events, lectures and workshops. Open daily between 9.00 am and 5.00 pm. The Rotunda gallery at 195 Suriwongse Road is situated next door to the British Club near Silom Road. 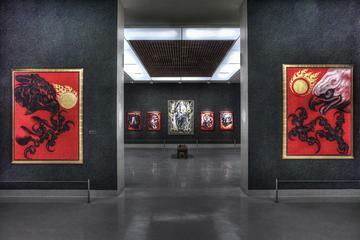 Exhibitions usually feature western artists who are resident in Thailand. Open Tuesday, Thursday and Saturday from 9.30 am until 16.00 pm. Wednesday from 9.30 am to 19.00 pm. Sunday from 9.30 am to 14.00 pm. H Gallery, located at 201 Sathorn Soi 12, is one of the Thai Art Galleries holding exhibitions in a restored late 19-century colonial building in downtown Bangkok off Sathorn Road. It is owned by American, H. Ernest Lee, who has considerable knowledge of Thai contemporary art and hence the gallery exhibits contemporary Asian art exclusively. Open daily from 10.00 am until 6.00 pm except for Tuesdays. The Chiang Mai University Art Museum located at 239 Nimmanhemind Road, Suthep district Meung in Chiang Mai is open on Tuesday until Sunday from 9.00 am to 5.00 pm and closed on Monday and public holidays. Exhibitions include both modern, contemporary and traditional local and international art. The Galerie Panisa at 189 Mahidol Road, Haiya, Muang in Chiang Mai holds regular exhibitions all year round by traditional and contemporary Thai artists. The gallery is open every Monday to Saturday from 9.00 am to 6.00 pm. Gongdee Gallery at 30 Nimmanhaemin Road Soi 1, Suthep, Muang in Chiang Mai specialises in creating a degree of excellent by establishing a quality collection of items made entirely from a number of local materials found in this northern region. Thai carvings are some of the products produced in the gallery. La Luna Gallery at 190 Charoenraj Road. T.Watgate, Muang in Chiang Mai is one of the Thai Art Galleries exhibiting both contemporary and abstract art in the form of paintings, posters, pottery and photography from renowned and emerging young artists in Asia Pacific including Thailand, Burma, Laos, Vietnam, Malaysia and Indonesia. Paintings in the gallery reflect magnificently, colourful images depicting aesthetic, spiritual, social and cultural issues in our ever-changing environment. Open Tuesday to Sunday from 10.00 am to 8.00 pm.